The year is 1989. Seemingly identical palm trees sway by the deep blue ocean and mark the rhythm of an unseen wind. A perfectly paved road becomes the rapid animation of yellow divider marks as you fly through in your mint Turbo Trans. No bystanders to gawk. No police to stop you. All competitors are dots in your rear-view mirror. It’s just you, the gas pedal, and the never-ending road. Then the timer hits 00 and you realize you’re all out of quarters. 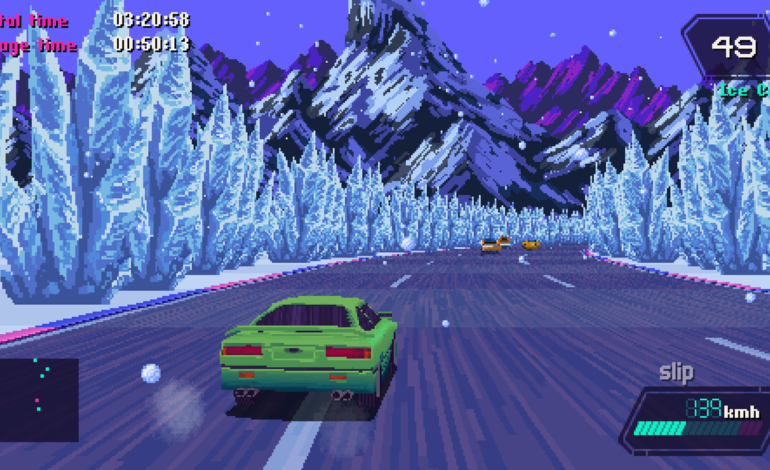 Slipstream is a racing game inspired by the visuals, music, games and cars from the late 80s and early 90s. It’s built on a custom game engine, with an authentic retro feel and unique graphics. 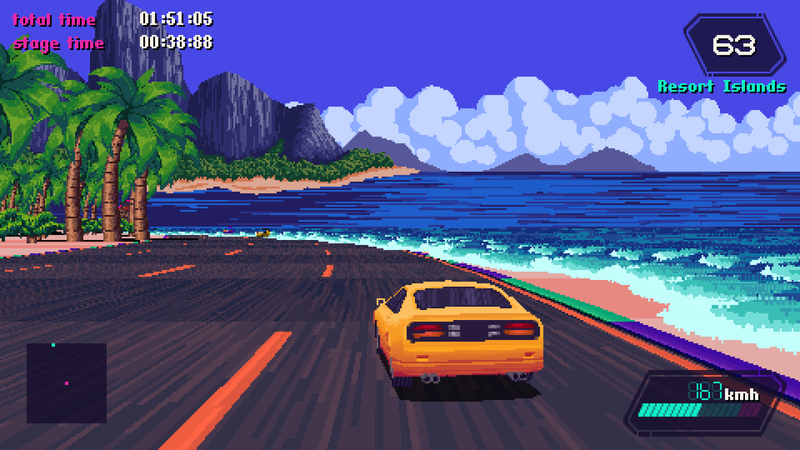 The soundtrack, drawing from synthpop and jazz fusion influences, sets the tone for a race across a variety of exotic locations from all around the world, including cities, deserts, forests, mountains and beaches. Drifting and slipstreaming mechanics add depth to the driving gameplay, and the result is a challenging and exciting experience. Simply put, the retro aesthetic of this game is spot on. andsor’s art with Moser’s soundtrack could be claimed as an actual product from the era they are recapturing. The long road to release was made smooth thanks to the developer’s consistent interaction with patrons of the game. Starting in 2015 with Kickstarter and (the now-retired) Steam Greenlight, the game was shared to supporters as a prototype. As you’ll see in the release trailer below, the art and mechanics have come a long way through andsor’s impassioned dedication. For those who prefer revisiting retro classics as they were presented in their time, andsor has included 30fps, CRT and NTSC graphical modes. In addition, another core aesthetic that needs to be noted is the developer’s excellent inclusion of “secret levels”. Many will recall 80s-90s gaming having a knack for hidden details, leading kids on the playground to argue back and forth about Easter eggs they may or may not have found. Slipstream is available now for PC, Mac and Linux. The developer has also stated that 4-player local multiplayer and a track editor are currently in the works to be released in a free update.